Cuban aid to Haiti is 250 times greater than US per GDP but ignored by US media. At the recent UN Donor Conference on Haiti, Cuba announced a programme to rebuild that country’s entire national health service. Although this was, arguably, the most ambitious and impressive ’pledge’ of the 59 governments, regional blocs and financial institutions that made commitments, it was largely ignored by the leading US media-and hence overlooked by most of the world. -Setting up of a tertiary-level specialties hospital level staffed by 80 Cuban specialist doctors; with various clinical departments, to be used for research, teaching and training of Haitians to replace the Cubans. -Provision of 312 additional medical scholarships for Haitians to study in Cuba. 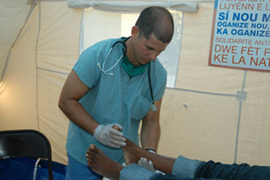 The Cuban programme is not merely a pledge, but a development of medical assistance provided since 1999, dramatically increased since the earthquake. The Cuban medical brigade in Haiti has a presence in 127 of the 137 communes, saved 223,442 lives, treated 14 million people, performed 225,000 operations and delivered 109,000 babies. Since the earthquake, 23 of the primary care health centres, 15 community reference hospitals and 21 rehabilitation rooms have been put in operation. The cost of the Cuban programme over ten-year period is estimated at US$690.5 million. Cuba’s contribution, in relation to its GDP, is 152 times that of the United States, which pledged US$1.15 billion. France pledged US$188.93 million, Germany US$53.17 million, Japan US$75 million, and Canada US$375.23 million. Italy and the UK were probably included in the US$203.19 million pledge by ’EU Remaining’ group of countries. In absolute terms the value of Cuba’s contribution is almost four times that of France, 12 times that of Germany, and almost twice that of Canada. Excluding the US, it exceeds the rest of the G7 countries combined and that of the World Bank (US$479 million) by 35 per cent. While other countries are pledging money, Cuba is actively creating an entire sustainable health care system that will treat 75 per cent of the Haitian population, and save hundreds of thousands of lives. Analysis of the coverage of the Conference by five major US media-CNN, the New York Times, the Boston Globe, the Washington Post, and the Miami Herald-revealed that, of 38 posts recorded in the ten days immediately following the Conference, only one (the Miami Herald) mentioned the Cuban contribution. A search of the first 50 results in Google News for ’United Nations Haiti Donor Conference’ produced only two articles that mentioned Cuba’s role. The main theme of these articles was the importance of the US role in helping Haiti. The US effort was often described as being equally or more important than that of the UN. Thus one stated, ’The biggest contributions came from the United States and the European Union’-which is not even true, given that Venezuela pledged US$2.4 billion. The United States consistently headed the list of contributing countries. In preference to reporting on a Cuban programme which will improve the lives of 75 per cent of Haiti’s population of nine million, these media have highlighted the US role in Haiti. In their Cuban coverage, they have chosen to focus on the cases of two men who have deliberately decided to embark on a suicidal course, presented as martyrs, with the obvious aim of embarrassing the Cuban Government. Selective commendation in one case; selective indignation in the other. We are supposed to believe, however, that these media are ’free’ and ’unbiased’. Unfortunately, much of the rest of the world’s media take their cue from this kind of selective reporting. This needs to change. Previous PostPA AFL-CIO: No Endorsement for GovernorNext PostWill the Real Tea Party Movement Please Stand Up?